I am always on the look out for fast and easy recipes. Especially on those nights where I am just cooking for one. So when I found myself with an extra poblano pepper and a rumbling stomach you better believe I was all about a quick 5 ingredient or less dinner that would come together in a pinch! 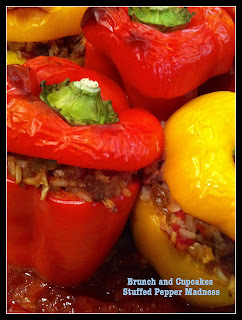 If you have been reading my blog for a while you know that I am a huge stuffed pepper fan. Just look at all the stuffed pepper recipes that have been featured on the blog. So when a quick recipe search produced dozens of stuffed poblano pepper recipes I knew exactly what I was going to make. I settled on the following recipe from Cooking Light for a Cheesy Refried Bean Stuffed Poblano Pepper. You can find the recipe here. And since this recipe had a mere 5 ingredients this dinner took no time to prepare (we are talking 15 minutes)! I loved that I could sub in whatever ingredients I had on hand. Since I had no instant rice in the house I omitted the rice and crushed up a few tortilla chips which I sprinkled on top for some added crunch! The results? Pretty darn good! Easy enough to make for just one and tasty enough to make again! Try it tonight!